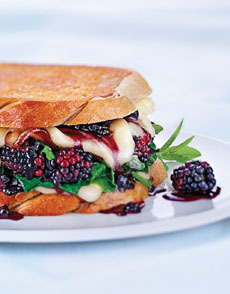 Top: The first contest winner, “Bewitching,” with arugula, bacon, blackberries, spinach and two cheeses. 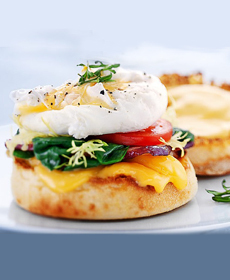 Second: Grilled Cheese Benedict with Canadian bacon, poached egg, spinach and Gouda on an English Muffin; both from The Grilled Cheese Academy. 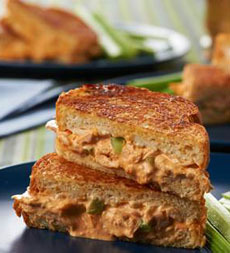 Third: Buffalo Chicken Grilled Cheese from QVC’s Chef David Venable. 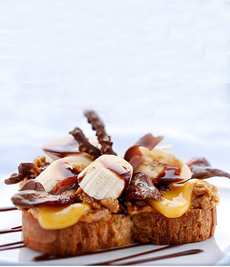 Bottom: The Lisa Marie, Elvis’ favored fried PB & banana sandwich with bacon, cheese and hot fudge, from The Grilled Cheese Academy. April is National Grilled Cheese Month, with National Grilled Cheese Day celebrated on April 12th. We even have a trompe-l’oeil grilled cheese: Grilled Pound Cake & Frosting that looks like grilled cheese. And you must take a look at Denny’s Fried Cheese Melt, made with American cheese and a layer of fried mozzarella sticks. The Grilled Cheese Academy.com, a website from EatWisconsinCheese.com, is a treasure trove for lovers of grilled cheese. Since 2012, they’ve sponsored an annual Grilled Cheese Recipe Showdown. All the winners and runners up are posted on the website, along with a myriad of fetching grilled cheese sandwiches developed by the Academy. You can enter the contest (by May 15th) and download e-books of each year’s winners. In case you need some encouragement, the top prize is $15,000. This beauty (top photo), called BEWITCHING, took the top prize in the first Showdown. It was created by Ally Phillips of Murrells Inlet, South Carolina. Ally’s bewitching concoction layers fresh blackberries, peppery greens, crispy fried bacon and molten Wisconsin Gouda and Provolone. 1. MIX the arugula and spinach in small bowl; set aside. Trim the crust from 3 sides of the bread slices, leaving the curved top crust attached. Butter the bread slices on one sides. 2. COAT the skillet (preferably cast iron) heavily with cooking spray and then heat it. Place 2 slices of bread, buttered-side down, in the skillet; there should be a slight sizzle. Place 5-6 blackberries in the center of each bread slice. 3. TOP the berries with a slice of Provolone. Add another handful of berries and top with Gouda for the second layer. Place 3 strips of bacon on each sandwich and place a bread slice on top, buttered-side up. 4. MELD and compact the sandwich, using a spatula to press firmly. Grill 2-3 minutes until the bottom is browned; flip and grill another 2 minutes or until the cheese is melting. 5. REMOVE the sandwiches to plates. Carefully pull back the top slices and spread the arugula and spinach mixture on top of the bacon. Replace the top, pressing down, and then flip the sandwich so the greens are on the bottom.